The inspiring story of how one couple dedicated their lives and fortune to improving educational opportunities for underprivileged children. Joe and Carol Reich are the co-founders of the Beginning with Children Foundation which opened the first charter-like school in New York City in 1992. Joe Reich also founded Reich & Tang, Inc., a leading investment firm in 1970. Carol Reich is the former President of the Lexington Center (formerly, the Lexington School for the Deaf). "If you have any doubt that an individual can change the world for the better, read this book." 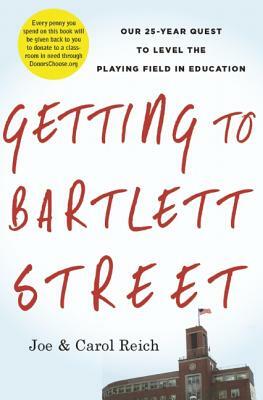 "Getting to Bartlett Street is the inspiring story of a visionary couple who fought with grit and determination to ensure that families in New York's low-income communities can provide the education they want for their kids." In creating Beginning with Children School, Joe and Carol Reich created a new model school six years before charter legislation passed in New York. Many of the innovations in their groundbreaking work influenced charter school legislation in NY State and throughout the country. All those who succeeded them owe the Reichs a debt of gratitude. "This is an inspiring and eye-opening book by two pioneers in the education reform movement that will make you believe in the goodness of people and the power of the human spirit."